DELHI, DELHI, INDIA, April 3, 2019 /EINPresswire.com/ -- Data powers almost all technologies that transform the way we do business, this includes transformation technologies such as artificial intelligence, automation and predictive analytics. If data is truly such a precious commodity then we need to ensure it is well protected and there are no risks in association to breaches and must be effectively managed. Girikon's commitment to the market and to its customer is to ensure sensitive information entrusted with our organisation is secure and a priority for every piece of information Girikon is dealing with on a day to day basis. Girikon is a Salesforce Silver Consulting Partner, Oracle Gold Partner, Microsoft Silver Development Partner and Abode Technology Partner and has been ISO 27001 certified since 2016. Over the last few weeks Girikon has undertaken an external audit to ensure maintenance of this certification assessing important areas of operation. As a partner to most of the key technology platforms and the additional boutique services such as Data Management, Data Mining and Artificial Intelligence, Girikon is serious about how it treats, handles and stores its customer’s data. 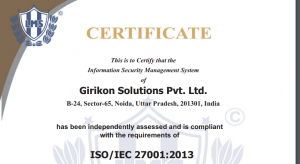 ISO 27001 gives Girikon's clients a guarantee that it has implemented best practice information security methods including a strong focus on confidentiality, integrity and availability. Maintenance of the ISO 27001 certification shows that Girikon has a proactive approach towards information security threats and have adopted best practices to minimise any risk associated a customer’s precious commodity. Ashok Anibha, Girikon General Manager, Technology and Operations based in Noida, India commented on the recent ISO27001:2013 assessment. Girikon has invested over a long period of time in world class facilities in Phoenix Arizona, US and Melbourne, Australia and has a dedicated state of the art offshore development and support infrastructure in Noida, India. We believe there is a close alignment between our “ingredients for success” which are people, processes and technology and our priority to obtain relevant certifications as proof that Girikon is serious about building a strong informed team, reliable processes and a leader in cutting edge technology. Our focus also extends to investing in risk management and continuous improvement practices. This investment is priceless and in part focussed on ensuring that a data breach do not occur, and our customer's information is safe. Girikon has also ensured that maintaining an Information Security Management Systems in a very effective way will lead to greater information security and a reduction of risks associated with data breaches. Girikon is proud of its team of experienced and certified Salesforce Consultants including Architects, Developers, Business Analysts and Administrators. Girikon’s strength lies in Salesforce implementation, customization, development, integration and support. Girikon Australia can be contacted toll free on +61 1300 332 888 and can be found at Level 1 & 2 161 Collins Street Melbourne. Visit www.girikon.com for further details on their services and management team.